Dynamics Confessions Blogspot: Allocating Tips in Payroll – How and Why? Allocating Tips in Payroll – How and Why? This posting steps through the tip allocation computation used by the Payroll module in Dynamics GP. Some questions have come up lately on the forums; rather than posting a lengthy answer, I thought it would be better to cover it in more detail in my blog. What is it? -- The IRS has set a minimum amount that it expects waitstaff should have included in income for tips. The tip allocation calculation function merely adds an amount to taxable income; it does NOT result in an extra amount going into the paycheck. The amount includable in income for an employee who is directly tipped is the greater of (a) the amount they reported to their employer or (b) their allocable share of the minimum amount established by the IRS (for 2009 it was 8%). An indirectly tipped employee does not receive allocated tips. Generally, indirectly tipped employees receive their tips from other tipped employees rather than directly from the customers. Positions such as cooks, bussers, hostesses, barbacks, and dishwashers are typically indirectly tipped employees. Of course, an employee could receive both direct and indirect tips, if so they will be included in the allocation computation for their direct tips. Reading it again won’t help. I think an example is in order. During a payroll period, gross receipts at Tailspin were $15,500. Total tips reported by employees for this period were $980. Directly tipped employees reported $430 and indirectly tipped employees reported $550. Based on the IRS guidelines, the employees’ total tips should have been 8% of $15,500, or $1,240. Our job is to properly calculate and allocate the $260 shortfall. 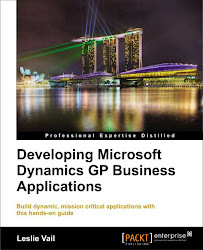 Dynamics GP can do it! 2. Select the Options button on the lower right-hand corner of the Payroll Setup window. 3. Mark the Calculate Tip Allocation checkbox in the Options section of the Payroll Setup Options window and set the Tip Allocation Rate to 8.00% (or whatever applicable percentage). The allocation rate is determined by the IRS. Unless a lower amount was negotiated with the IRS, the rate was 8.00% for 2009. For the payroll period, Tailspin has total gross receipts of $15,500. Total gross receipts are calculated by adding together the individual employee receipts entered on the payroll transaction. The employee’s receipts are entered on the Payroll Transaction Entry window with the ‘show’ details open. The Calculation -- Total gross receipts were $15,500, total reported tips were $980. Tips received directly were reported as $430. Tips received indirectly were reported as $550. The amount used to calculate each directly tipped employee’s share of 8% of the gross is $690. 3. Calculate each directly tipped employee’s share of 8% of gross receipts. 5. Calculate the allocable share of the total tip shortfall. $1,240(total gross receipts x 8%) less $980 (total tips reported, includes direct and indirect) = $260(amount to be allocated among employees who had a shortfall). 6. Since employee BARR did not have a shortfall, there is no allocated amount to employee BARR. Leave it to the IRS to dream up this ‘simple’ allocation calculation. Fortunately Dynamics GP does it for us! I have done all of the above. do I have to manually add the allocated tip amount to each W-2? If you have set payroll up like described in this post, the allocated tips will automatically flow onto the employees W-2. You do not need to do anything manually. My question is we have several establishments that are reported on our 8027 by establishment - I have 7. Does this break it out by tip establishment or is this only applicable when you have one food venue to deal with? I was hoping this could be controlled with the Address ID, but that is not the case. Unfortunately, I do not know of how to break it up by establishment.